In the past few posts, I’ve covered a lot things through the mere acts of analysis and translation. While it’s clear enough to grasp, it might not be terribly useful to someone who has begun learning Japanese. Therefore, I want to write a lesson where I can just talk about the language in general so that those who still don’t know much about the language can feel relatively at home here. It’s a lot. You don’t need to have this committed to memory. It’s just good material to be familiar with. Nobody really knows for sure where the Japanese language came from. The most widespread hypothesis is that it is part of a family called Altaic, which includes Turkish and Mongolian. However, the existence of an Altaic family remains controversial and so this hypothesis, although widespread, does not have wide acceptance. Why am I bringing this up, then? Because I want to point out that 1) we still have much to learn about Japanese and that 2) what we know for sure, is that Japanese is not related to any of the Sinitic language (a.k.a. 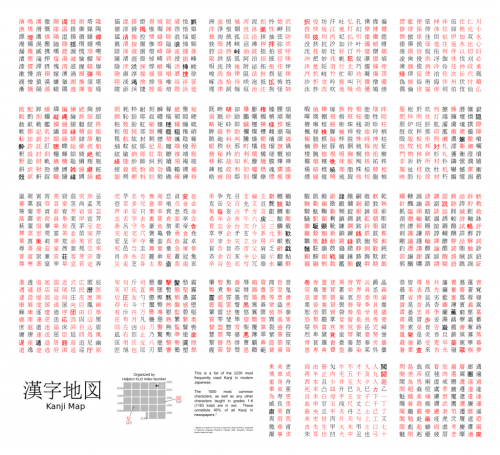 vulgarly as the Chinese languages). So don’t try to learn Japanese through comparing it with any other language as you might with another language. Japanese, like so many other languages, has a long history. By history we mean records that prove its existence. Historical linguists will divide Japanese into Old Japanese, Middle Japanese, and Modern Japanese. Both Middle and Modern Japanese are divided further into Early and Late. In the case of “Late Modern Japanese”, that means contemporary Japanese. Japanese and English are comparable in this respect. English is studied in Old, Middle, and Modern phases. Old English is the language of Beowulf. Middle English is the language of Chaucer. Early Modern English is the language of Shakespeare. And Late Modern English is the language of this post. Just like you cannot understand Beowulf and The Canterbury Tales without special training, the Japanese cannot understand Old Japanese and Middle Japanese without special training. But they can understand Early Modern Japanese if they break out a dictionary and work their way through it. What we are studying here is “Late-Late” Modern Japanese. When does Late Modern Japanese begin? That’s difficult. Early Modern Japanese began in the 17th century in the Edo Period, but it was still significantly different from what we see today. Before World War II, we still had some sounds that have aren’t in use today. I would put the date at the Meiji Period, which is when Japan begins its modernization. “Late-Late” Japanese, then, is after World War II, which is when the education system became standardized, the Jouyou Kanji came around, and the Japanese media surged. Chances are that if you’ve watched enough anime, you know what Japanese sounds like. Japanese has a very small collection of sounds. Not as small as Hawai’ian, but still very small. Wikipedia has a good article on phonology. I’ll give you the simple explanation here. Japanese words are constructed from morae, which is in many ways like a syllable. You can see them here. All words will come from these morae. So a word like “Chimgal” cannot exist in Japanese. (The Japanese’s infamous trouble pronouncing things in English and most foreign languages comes from the fact that they think in terms of these morae). The only sounds omitted here are the ones one can create with the morae starting with the semi-vowel /y/ and any of the consonants. So you have “hyo”, and “nyo” and “kyo” sounds as well (this is called palatalization). The other sound omitted is /m/, to put it technically, shares the phoneme “n” with /n/. To put it simply, the /m/ sound and the /n/ sound are used in distinct cases. If “n” is followed by /b/ or /p/, it sounds like an /m/. This is why you see the word せんぱい (in which that ん is transliterated as “n”) but you pronounce it sempai. There’s also a glottal stop (which is the short stop you make when saying pizza). You’ll know it’s there because of a small つ, っ.
That’s all you need to know for now. Here’s the big one for today. Japanese has one of the most inefficient writing systems in the world. That’s just a fact. It’s a system that has far too many dimensions for it to be seen as practical. Even the Chinese languages, which use more logograms than Japanese, have it easier because there’s less to memorize. Japanese has two syllabaries and one large set of logograms. 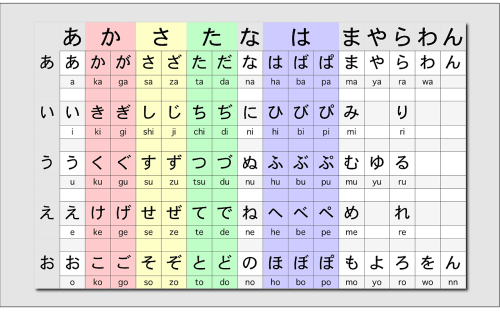 The two syllabaries are called hiragana and katakana. They describe syllables (I know I said Japanese runs on morae, but we still call these syllabaries). Hiragana and Katakana have a 1-1 relation, meaning that anything you write in Hiragana you can write in Katakana without any problem. As for the syllabaries, learn them. You don’t need to know a single word of Japanese to start with this. It takes about 8 hours to get them down. It’s a fun thing to do on a Saturday. There are a million little flash games out there to help you with this. In our next Japanese from Zero, we’ll be talking about nouns, adjectives, adverbs, and verbs.